Thank you Melissa and Jeff for the update! Restaurant Week is EXTENDED until Sept 6th! Plan on making reservations for One If By Land, Two If By Sea; 21 Club and Le Cirque look forward to posting my experience. Keep your fingers crossed stomach can't afford another disappointment! Last week ended Summer Restaurant Week, a time where diners enjoy a 3-course menu at higher-end restaurants for a discounted rate of $24.07 at lunch or $35.00 for dinner. Usually restaurant week doesn't interest me much. Actually at one point it did, but working at my 9 to 5 provided no opportunity for a long lunch, leaving dinner as the only option. Knowing this, Alex and I made dinner reservations at Bolo (Bobby Flay) one year, but we were so disappointed by the food that I figured that the quality during restaurant week does not provide a true experience of the establishment. That or the food here really sucked! So after that experience I stood away. This year, with my new life of chef instructing I have more day time gaps in my schedule, making it a perfect opportunity to experience lunch! My good friend Melissa joined me at Bar Boulud (Chef Daniel Boulud). I loved the intimacy and coziness the place offered, not to mention seeing the beautiful pates and terrines displayed at the bar all calling out "Eat me, Eat me!" making it all the more exciting. The menu was very balanced and appetizing. Melissa ordered the Terrine de Porc and I the Thon Nicoise, followed by Dourade Poelee (sea bream) and Steak Roti and for dessert Gateau Roule and I, the Pot de Creme. From start to finish everything was delicious, the atmosphere was calm, relaxing, everything you wanted for a mid afternoon treat. So far so good! The next day a friend we met at Washington, DC during the Let's Move! event was in town from Chicago, the three of us met at DBGB's (another friend suggested we try it). DBGB has a earthy, manly, but elegant appeal. We sat down ordered wine and then began to order. Melissa and I ordered the Pate de Campagnard, Mecca ordered the DBGB Summer Salad, next she ordered the Housemade Orrechiette and us to girls the Yankee Burger with Cheddar, for dessert Raspberry-Yogurt Sundaes and I the Hazelnut Praline Chocolate Cake. Again another hit, the burger was amazing. I'm just loving restaurant week! That was until Alex and I reserved a dinner reservation at Dovetail. We were excited to try Dovetail, it's a cute little restaurant that would seem quite stuffy but was actually inviting. We were seated, had some wine, and received a delicious watermelon amuse bouche. Then came our appetizers, Alex ordered the White Gazpacho, I the Potato Gnocchi with Truffles. As soon as I put my fork down I truly believed we were on our way to a great dining experience. That was up until our main dish arrived. I ordered Chicken Breast, Alex the Braised Veal Shoulder. Let's just say we were super thirsty and that night woke up for several cups of water to help our bodies get off the sodium shock it received. Dessert--a part of the meal that serves as an ending--some argue it is the most memorable part of a meal, was even worse. Alex ordered the Banana Cream Parfait, equivalent to a jello pudding snack in a glass and I, Blueberry Crumble aka a fresh out the toaster pop tart with a bit of ice cream. The experience was absolutely disappointing. In all our years of dining, I don't recall us asking for the waiter for the check so quickly. Restaurant week offers us entry to restaurants at a discounted rate, but that does not mean the food should be as well. It's understandably that restaurant week attracts different clientele that may be different from their regulars, but that is not to say we wouldn't return as a full paying guest in the future. Isn't this the whole point?! Don't get me wrong, I am sure Dovetail serves remarkable food year round, but the execution of their restaurant week menu was mediocre at best (and I'm being kind), but considering what they served that night we won't be running back to find out. Of course, two out of three is not bad. Perhaps I was right with my original sentiments on restaurant week, or perhaps it's best to experience it during lunch time. Who knows! Would I try it again? Sure would, but I would be more careful and selective of where I'm making dinner reservations that's for sure! Today was my first day of putting Ms.Obama’s Let’s Move project in action. Where? At P.S.11 in NYC! I was fortunate to come across a school that has a wonderful relationship with a farm, more specifically Stoneledge Farm a certified organic farm in Greene County, NY. Every Wednesday the school receives fresh, seasonal, local crops, which the children sell at their very own farmer's market outside the school! Then I have the privilege of working with these ingredients as well and deciding on how they would become the star of the week's recipe. 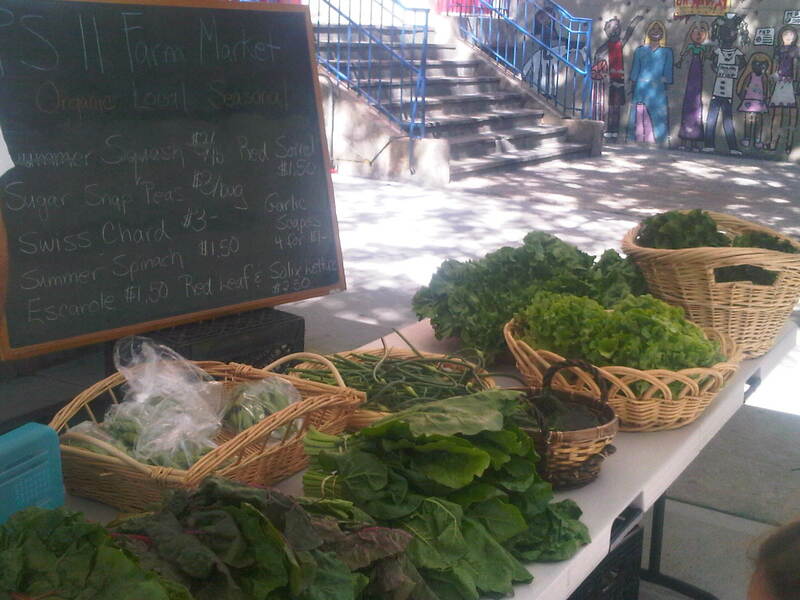 Today we had on hand, Chinese napa cabbage, rat tail radishes, scallions as well as beets, escarole and bright lights Swiss chard. Considering the delightful heatwave we are experiencing, I thought including a creamy cole slaw recipe would be ideal. Naturally, I had given other recipe ideas to Deborah--as we were both excited about the beets and greens--but the Napa Cole Slaw won! I had the pleasure of working with 3rd graders. The boys and girls each rushed to wash their hands and sit by a cutting board in anticipation of creating something fresh, healthy and delicious. I was so happy to see their eagerness and thrilled by how excited they were to work alongside a “real chef”. It warmed my heart to know how the profession I love so much has became the new “superhero” of choice for so many children! 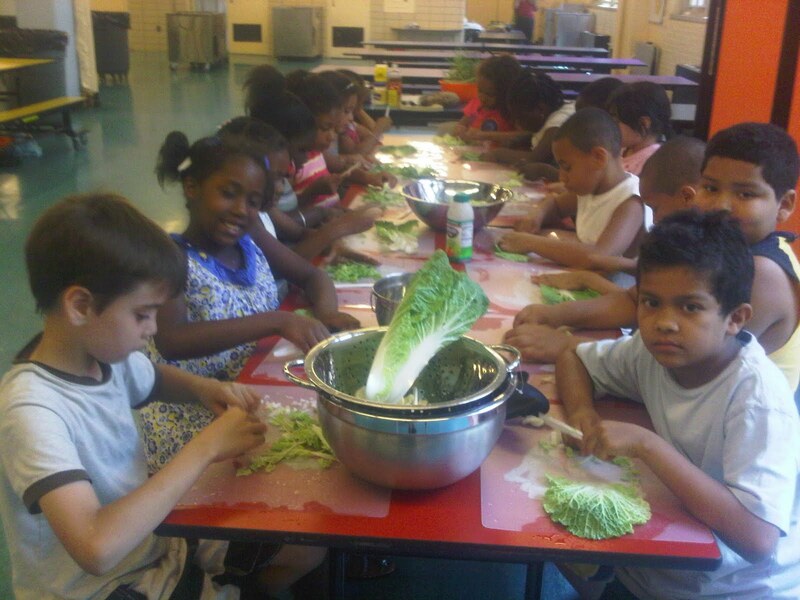 Moments later the boys and girls were working hard cutting napa cabbage, radishes, scallions and apples. I must say they did a great job in getting uniform pieces, especially considering that they were using plastic knifes. Then we were on to the dressing. We mixed buttermilk, apple cider vinegar, a bit of dry mustard, sugar, salt, and pepper. (You can get the actual recipe on P.S. 11's Blog click here!) 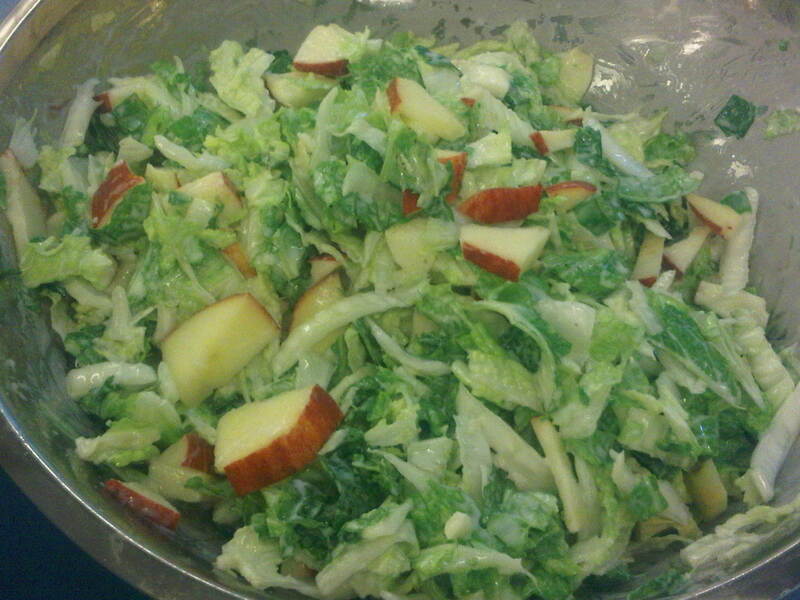 We lightly dressed our salad and allowed the dressing to do its work in wilting the cabbage. In the meanwhile I drilled them over the ingredients used and asked each student to explain a step in our recipe. I was delighted to know that when Deborah came over to inquire they all eagerly knew what made up their slaw. Half hour later we had Napa Cole Slaw! After a final taste we were ready to serve. I must confess as a student and I began passing out individual servings of our masterpiece I grew nervous of their reaction. I knew the slaw tasted good, but still serving a group of children a bunch of greens on the first day they meet you can be a little nerve wrecking. Their reactions: a unanimous 2 Thumbs Up!!! I was more than happy to provide them with the seconds, and thirds they requested and honored to have taken part of this mission! Together we made a great impact. 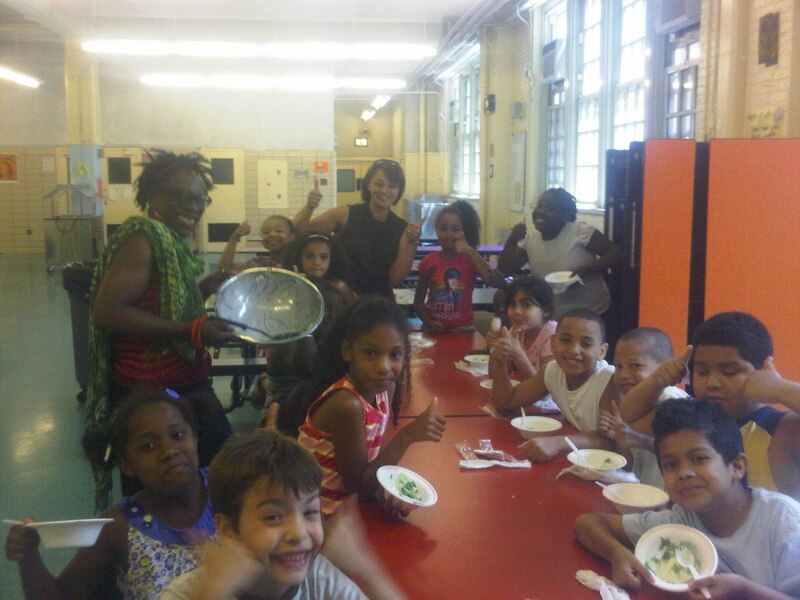 I am excited for a lot of things: Of working with the children next week, of learning of the bounty that awaits us in the upcoming weeks, and the endless possibilities and recipes that the summer will embrace us with! Cheers to a good start!